While there was not food-rationing in the United States during World War I, the United States Food Administration was responsible for overseeing the allies' food reserves. One of its important tasks was the stabilization of the price of wheat on the United States market. When the United States entered the War, President Wilson appointed Herbert Hoover to the post of United States Food Administrator (1917). Food had become a weapon in World War I and no country produced more food than America. ... Wheat used for bread and other food stuffs was the most critical agricultural commodity. Thus it was the commodity given the greatest attention by the USFA. One way of freeing up more wheat to feed the Army and to assist America's allies was to reduce domestic wheat consumption. Here the USFA came up with a range of ideas to use corn and other grains for a range of wheat products. ... Hoover called it food conservation, but many Americans took to calling it "Hooverizing." Various promotions were devised, such as wheatless Wednesdays and meatless Mondays. Hoover was convinced that Americans would cooperate voluntarily to support the boys overseas. He did not want a mandatory program and Government regulated rationing. The idea was that American civilians would have to modify their eating habits voluntarily so that more food was available for shipment overseas. The American housewife was urged to conserve food and eliminate waste. 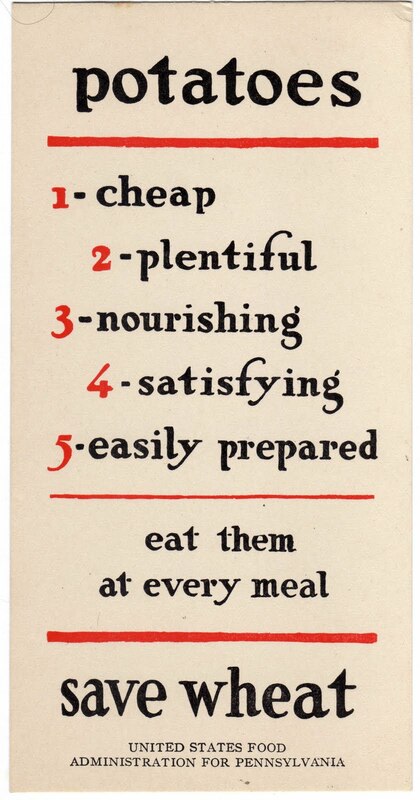 Signs and posters appeared in workplaces and public areas with the slogan "Food Will Win the War". Hoover managed to voluntarily reduce domestic food consumption 15 percent without rationing. I found this image of another World War I poster that urges Americans to save wheat, meat, fats and sugar and uses the exact same design as the "save wheat" card. With regard to that, the fastcodesign.com blog takes a closer look at graphic design and wartime posters and highlights some excellent examples, including a "save wheat" poster with the headline "Will you help the Women of France?" This page on Eat Drink Better is worth checking out for the United States Food Administration's suggested weekly planner for wheatless and meatless days and meals. Rae's Kitchen takes a look at the voluntary sacrifices made during World War I and offers up a recipe for yeast war bread. More potatoes and less wheat? Chris Voigt took it to a ridiculous extreme with his diet in 2010. Finally, here's a public-domain image from the National Archives that urges "Little Americans" to do their part to save wheat and "leave nothing on your plate." 1. I can't imagine these cards were ever reprinted in subsequent decades afte World War I, though I can't fully discount the possibility. So I think it's a fair assumption that this card is 93 or 94 years old. 2. The United States Food Administration oversaw numerous posters and public-awareness campaigns. Some of the illustrations and designs were created by Edward Penfield and F.H. Townsend, but it's not clear if either of them had a hand in the simple "save wheat" card featured in this post.